One problem: With over 60 posters in hand, it was necessary to thin the herd before a final vote. Thus, the idea of poster primaries came to be, with each primary having seven posters. This is the sixth primary, and there are enough posters in hand for at least three more. The winner of each of the primaries advances to the final. Contestants in this round: Penn State, Iowa, Southern Mississippi, Brigham Young, Utah, Houston and Rice. Click here to review the candidates' posters. Primary No. 1: Iowa State has a commanding lead over West Virginia. Where are the Mountaineer fans? Primary No. 2: Texas Tech would appear to have this primary wrapped up, with a huge lead over Idaho and Northwestern. Primary No. 3: This one is still up for grabs, with Michigan State leading North Carolina. The Missouri and North Carolina State campaigns have been big disappointments. Primary No. 4: A strong showing this past week by Louisiana Tech has vaulted it into the lead over Colorado. Florida State is a distant third. Primary No. 5: Another tight race, with Middle Tennessee clinging to a lead over Bowling Green. Washington, Wisconsin, Auburn and Kansas State fans, you should be ashamed. OK, we'll ask the tough question. Has Penn State intentionally softened the nonconference schedule to help Joe Paterno in his fight to the finish with Bobby Bowden for most victories by a Division I-A coach? A few years ago, teams such as USC, Nebraska and Miami could be found on the schedule. No more. In 2009, it's arguably the easiest nonleague schedule in I-A with Akron, Syracuse, Temple and Eastern Illinois (I-AA) visiting Beaver Stadium. With eight home games, Penn State fans are bullish on this team, but let's throw up some warning signs. Just nine starters return and the members of the offensive line have only 39 career starts. After rattling off nine wins in a row to start 2008, the Nittany Lions lost two of their last four. And when last spotted, Penn State trailed USC, 31-7, at halftime of the Rose Bowl. Thanks to Penn State Clips! Are the Hawkeyes a team on the upswing? Judging by preseason rankings, it would appear the college football world thinks so. Iowa won 31 games from 2002-04, then went a pedestrian 19-18 from 2005-07. The team rebounded and finished 9-4 in 2008, including a victory over Penn State that denied the Nittany Lions a shot at the Bowl Championship Series title game. The Hawkeyes were the only Big Ten team to win a bowl game, drilling South Carolina, 31-10, in the Outback. Running back Shonn Greene is gone, but the returning members of the offensive line total a Big Ten-best 98 career starts. Thanks to Grant! Larry Fedora has plenty to work with as he begins his second season as coach of the Golden Eagles Sixteen starters return, eight on each side of the ball. Quarterback Austin Davis will try to build on his freshman season, when he passed for 23 touchdowns and rushed for nine more. Receiver DeAndre Brown had a spectacular freshman season, catching 67 passes for 1,117 yards and 12 touchdowns. But Brown suffered a gruesome injury to his right leg in the New Orleans Bowl and has not been cleared to participate in contract drills. Thanks to Kirstin and Nicole! Poster designed by Old Hat Creative. The Cougars have been producing award-winning posters for years, and BYU really went the extra distance this year by traveling to the Bonneville Salt Flats and shooting not only the poster, but a video that you can view by clicking here. We couldn't wait to open the finished product after landed in the old inbox, but after inspecting the goods, it was clear something was missing. Where was the schedule? Not on this poster. After several late-night discussions with a distinguished panel of judges at various dens of depravity, it was decided to let the Cougar poster into the contest, even though it was missing this key ingredient. Two key nonconference games: Sept. 5 vs. Oklahoma in Arlington and Sept. 19 vs. Florida State in Provo. Win those games and the only stumbling blocks on the cruise to an undefeated regular season are Oct. 24 against Texas Christian in Provo and the Nov. 28 Holy War against Utah, also in Provo. Thanks to Jaren! You know the story. One of only six Division I-A teams to have completed an undefeated season since 2004. Winners of 14 in a row and 21 of 22. Utah 31, Alabama 17. 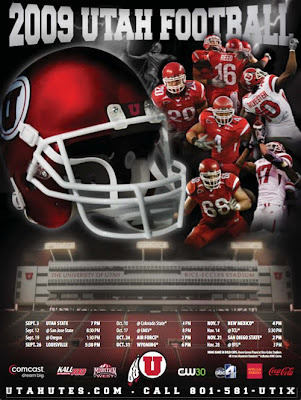 ... What do the Utes have to show for all this winning? Because they play in a non-Bowl Championship Series Conference, not much, but we shall crown them The People's Champion and urge Orrin Hatch and Mark Shurtleff to continue to fight the good fight. Here's the bigger question: Can they go undefeated again? It's not out of the question. The Sept. 19 game at Oregon could be tricky, as could the Nov. 14 game at Texas Christian. Then there is the Nov. 28 Holy War against Brigham Young, the last team to beat Utah way back in 2007. Thanks to Ann and Adam!